So after challenge one and two, last week we were set our third challenge by Lin & Leo. We were challenged to have a bit of "me time" and to come back and show how we spent our time. Now my response to this was, "this really is a challenge". As a mum to four kids, I don't really get time to myself because during the week, Daddy Hazelden is busy working so I look after our brood and the weekend is spent enjoying time together as a whole family. This is me with a rare bit of quiet time. Ok ok so I might not be out and about but do you see anyone else around?? Eldest two were at school, three year old at playschool and Layla was having a rare nap upstairs. 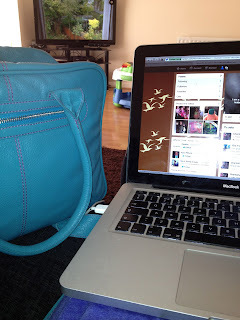 So this how I like to spend my "me time", with my bum firmly plonked on the sofa and laptop infront of me, this is when I catch up on my blog posts, get tweeting etc (yes I am a social media addict). As you can see my BabyBag spent this time with me, well it did have my note book in there which reminds what reviews I need to write every day. By this point you may think I am cheating slightly with this challenge but honestly "me time" is so hard to come by. 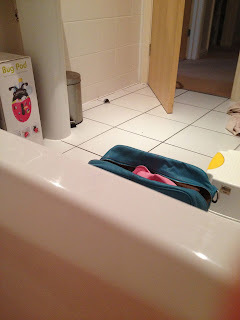 Monday night I actually had a bath with no children joining me, well for 5 minutes atleast, a couple of monkeys did eventually venture in to have a chat with me but I thought while I was on my lonesome the BabyBag could join me and keep me company!! So there we have it, challenge three attempted, not sure if I passed this one but I'm sure you will agree I should get an A for effort!!. Disclaimer : This is part of an ongoing challenge with Lin & Leo, the bag was sent to me free of charge but all thoughts and opinions are my own. Thank you :) I really do love this bag.